Washington (AFP) - US President Donald Trump demanded Wednesday that Russia remove troops from Venezuela and said again that he was not ruling out military action to topple far-left President Nicolas Maduro. Russia's deployment of troops and equipment to bolster Maduro has ratcheted up already high international tension in Venezuela where the Trump administration is pushing hard for regime change amid mounting chaos in the once rich country. 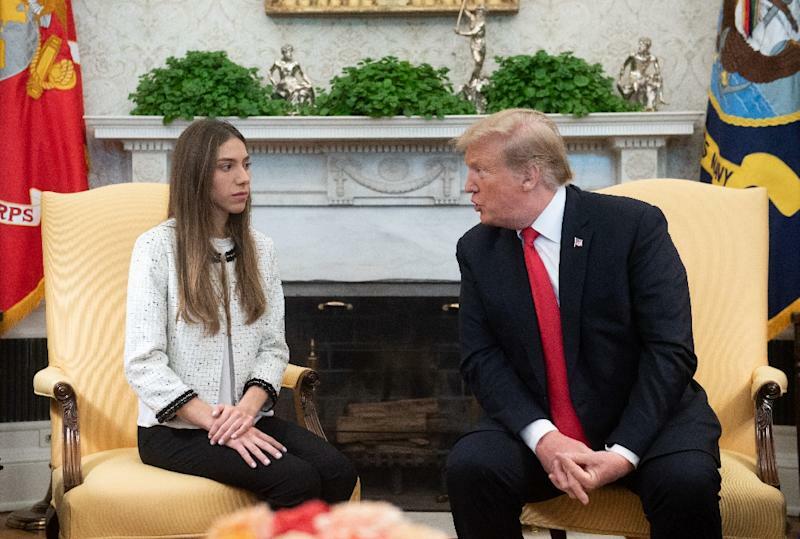 "Russia has to get out," Trump said at the White House alongside Fabiana Rosales, wife of opposition leader Juan Guaido, who has been recognized by the United States and more than 50 other countries as Venezuela's interim president in place of Maduro. Russian foreign ministry spokeswoman Maria Zakharova dismissed Trump's demand, asking in return why US troops were still in parts of Syria, where the Assad regime relies heavily on Russia support. "He said the United States would withdraw from Syria a month ago," she was quoted as saying by Interfax news agency. "Before deciding the fate of another country I advise fulfilling promises made to the international community." The high-profile reception given to Rosales was the Trump administration's latest bid to boost Guaido, who is under severe pressure from Maduro. On Thursday, she will meet with US First Lady Melania Trump in Florida. Trump said "all options are on the table" when asked by journalists if the United States was considering military action to back a campaign of economic sanctions aimed at crippling the Maduro government's finances. "They've got a lot of pressure right now. They have no money, they have no oil, they have no nothing. They've got plenty of pressure right now. They have no electricity," he said. "Other than military you can’t get any more pressure than they have ... All options are open." "He's been very clear when he says all options are on the table," Trump's national security advisor John Bolton told reporters at the White House. "He's very determined to see this through," Bolton said. "To minimize the suffering of the Venezuelan people we think it's important to bring this to a conclusion as soon as possible." Testifying before Congress, Secretary of State Mike Pompeo reiterated that the United States did not plan to negotiate with Maduro. "I must say that there is no evidence that there is any value in speaking with Maduro at this time. His time has come, his time has gone, it's time for him to leave," he said. Pompeo appeared to confirm that talks were taking place to find a way for Maduro to go into exile. Representative Albio Sires asked Pompeo whether Mexico and Norway, which have both offered to broker an end to the crisis, could find a way to move Maduro out of Venezuela. "Yes, I've personally been in conversations with each of those two governments," Pompeo replied. Earlier, Rosales met separately with Vice President Mike Pence, who plays a major role in the administration's aggressive stand against Maduro, and who also called out Russia. He said "the United States views Russia's arrival of military planes this weekend as an unwelcome provocation and we call on Russia today to cease all support for the Maduro regime." "Guaido is the only legitimate president of Venezuela. Venezuela is in crisis after years of dictatorship and oppression," Pence said.